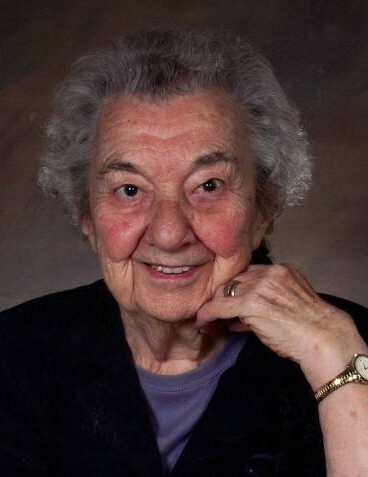 Ilene G. Sprunger, age 102, of Fort Wayne, Indiana died Saturday, January 19, 2019 at Canterbury Nursing and Rehab in Fort Wayne. Mrs. Sprunger was born in Monroe, Indiana on February 25, 1916 to Simon and Martha (Shank) Smith. She married Walter M. Sprunger on May 17, 1936 in Monroe, Michigan and he preceded her in death on May 1, 2004. Daughter, Barbara and David Eicher of Ossian. Son, Ronald J. Sprunger of Loveland, Ohio. Daughter, Karen and Steve Kracium of Fort Wayne. 7 grandchildren, 2 step grandchildren and 11 great grandchildren. Five sisters and six brothers preceded her in death. Visitation will be held Thursday, January 24, 2019 from 3:00 – 7:00 PM at Grace Point Church of the Nazarene, 8611 Mayhew Road, Fort Wayne, Indiana. Funeral services will be held Friday, January 25, 2019 at 11:00 AM at Grace Point Church with Pastor Rex Persons officiating. Burial will take place at Covington Memorial Gardens in Fort Wayne. Memorial donations may be made to Heart To Heart Hospice or Eicher House Ministries. Arrangements by Northern Indiana Funeral Care of Fort Wayne.